Even home owner wants to make their home look more stylish and attractive. Window awnings work out to be a great addition to any home setup for decoration purpose and also for increased functionality. Sitting inside your house or balcony under the shades of awnings and enjoying the sunset with a cup of coffee is one of the great feelings. Most people think that awnings are only suitable for outdoors but this is not true. Yes! Awnings are equally suitable for interiors adding more charm to your home. Every house is designed with doors and windows to allow air and sunlight into the house. But no one prefers to have sunlight in the house at all the times as it warms the temperature inside the house. It is acceptable only for some time i.e., morning and evening sunset. In order to cap the required sunlight and warmness, it is necessary to use shaded window awnings inside the house. Awnings are available in many colors, types, and patterns. If you have decided to make your home look stylish and decorative allowing only required sun shade through awnings then you need to decide on the type of pattern of awnings you want to install. In order to choose the best choice among multiple choices, you need to know about these deciding factors. Based on these you can then select the suitable option for your home. Before you choose the awnings it is better to first list out your preferences and also consider the purpose and place you want to use it for like interior or exterior. After listing out your preferences you can go for the fabric choices. Fabrics used for awnings are available in multiple colors and patterns reflecting your interior style and foyer. Traditional colors, stripe patterns, beige, salmon, stripes, Southwestern are some famous awning types which can be chosen based on the type of house like traditional, colonial, cottage style, stucco-sided buildings. After choosing the suitable fabric and color you can then go for the pattern choice. Choose a pattern in proportion to the window size. If the window is small then go for a wide stripe pattern and if the window is large then go for a small stripe pattern. Choose suitable bindings to your awnings that can create a match between the paint color, and trim color. Select suitable valence to create continuity between your interiors. If the main purpose for window awnings inside the house is to reduce the direct sunlight coming into the house then it is best to choose light color awnings which reflect direct sunlight to the maximum. These will also help to suppress the heat entering into the house through windows maintaining stable temperature all the day. 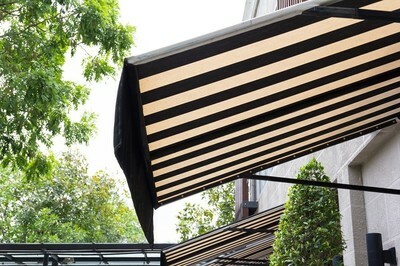 You can also choose opaque and firmly woven awnings will help you more in blocking the sunlight. Window awnings are available in different materials like fiber, wood, glass etc. You can choose appropriately based on your interior style and requirements. Moreover, there are some flexible awnings available in the market which can be controlled using sliders based on your requirement. All the above-listed factors will help you choose the best and suitable window awnings for your house. Whatever may be the material you choose for awnings, it is easy to maintain them with less maintenance. Most of the awnings are highly tolerable and as built for long lasting use. So it is one time choice for long term use. If you choose the fabric, you will have an advantage of changing fabric color and pattern based on the changes made to your interiors.